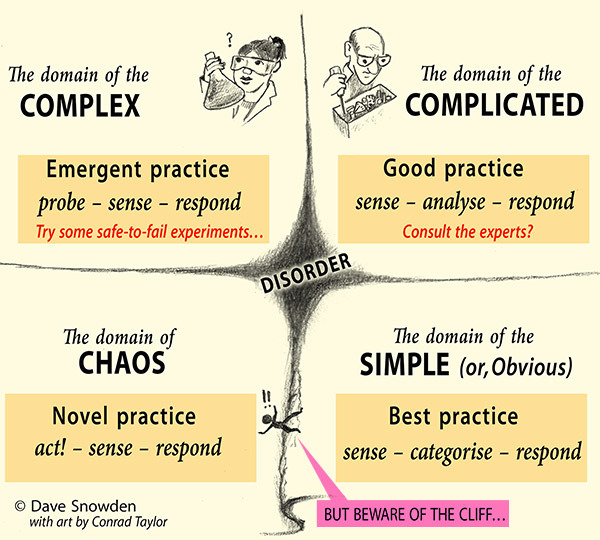 In the mid 1970s I lived in the same house as Dave Snowden, but lost touch with him, until in February 2009 I was invited to an event at which Dave spoke about Cynefin and broader aspects of his thinking. See here for an account. At this NetIKX afternoon seminar, we got a very thorough introduction to Cynefin, an analytical framework which helps decision-makers categorise problems surfacing in complex social, political and business environments. We also learned about SenseMaker, an investigative method with software support, which can gather, manage and visualise patterns in large amounts of social intelligence, in the form of ‘narrative fragments’ with quantitative signifier data attached. Tony Quinlan also used to work for IBM, in internal communications and change management; he then left to practice as an independent consultant. Around 2000, he set up Narrate, as he recognised the valuable information which is held in narratives. Then in 2005, as Dave Snowden was setting up Cognitive Edge, Tony became aware of the Cynefin Framework – a stronger theoretical basis for understanding the significance of narrative, and how one might work effectively with it. There several ways of working with narratives in organisations, and numerous practitioners. There’s a fruitful workshop technique called ‘Anecdote Circles’, well described in a workbook from the Anecdote consultancy. (See their ‘Ultimate Guide to Anecdote Circles’ in PDF). There is also the ‘Future Backwards’ exercise, which Ron Donaldson demonstrated to NetIKX in a March 2017 meeting. (report available on this site). These methods are good, but they require face-to-face engagement in a workshop environment. A problem arises with narrative enquiry when you want to scale up – to collect and work with lots of narratives – hundreds, thousands, or more. How do you analyse so many narratives without introducing expert bias? Tony found that the SenseMaker approach offered a sound solution, and so far, he’s been involved in about 50 such projects, in 30 countries around the world. Tony remarked that there is quite a body of theory behind the Cognitive Edge worldview, combining narrative-based enquiry with complexity science and cognitive neuroscience insights. But the real reasons behind any SenseMaker enquiry is, ‘How do we make sense of where we are? What do we do next?’ So he promised us a highly practical focus. Extra-large Post-It notes had been distributed to our tables. Following instructions, we each took one, and wrote a brief narrative about the experience we’d remembered. After that, we gave our narrative a title. We were also given sheets of sticky-backed, coloured dots. We took seven each, all of the same colour, and wrote our initials on them. We each took one of our dots, and stuck in on our own narrative sticky note. Then, we all came forward and attached our notes to the wall of the room. 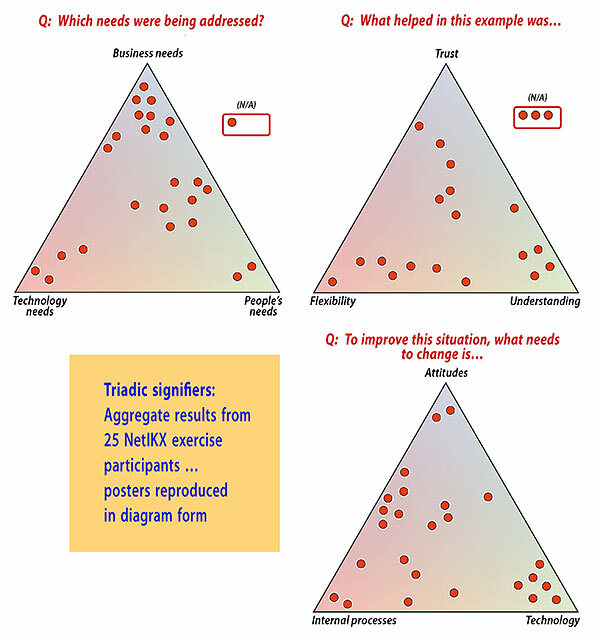 In the diagrams below I have represented how our group’s total results plotted out over the triads and dyads, but I have made all the dots the same colour (for equal visual weight); and obviously, there are no identifying initials. When SenseMaker signifiers are constructed, a dyad – also referred to as a ‘polarity’ – has outer poles which are often equally extreme opposites (‘too bureaucratic – too risky’). But in designing a triad, the corners are equally positive, equally negative, or neutral. For practical operational reasons, we all placed our dots on a common poster. This probably means that people later in the queue were influenced by where others had placed their dots already. In a real SenseMaker implementation, each person sees a blank triangle, for their input only. Then the responses are collated (in software) across the entire dataset. There can be further questions e.g. to ascertain demographics. This allows for explorations of the data, such as, how do opinions of males differ from those of females? Or young people compared to their elders? But the signifiers can be thrown up en masse on a computer screen in a visual array, like they were on our posters. Then it’s easy to spot significant clusterings and outliers, and you can drill down to sample the narratives with a single click on a dot. Even with our small sample we could see patterns coming up. 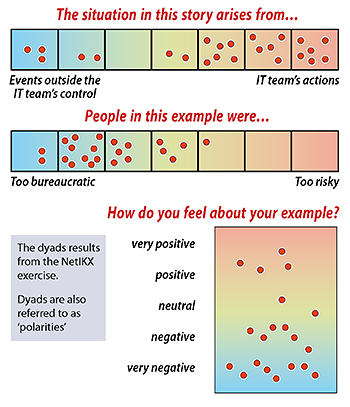 One dyad showed that most people thought the IT department was to blame for problems. With SenseMaker software support, this can scale. Tony recalled a project in Delhi with 1,500 customers of mobile telecoms, about what helped and what didn’t when they needed support. A recent study in Jordan about how Syrian refugees can be better supported, gathered 4,000 responses. Examining people’s micro-narratives shows us the stories which people tell about their world, and which shape opinions and decisions and behaviour. In SenseMaker, unlike in polls and questionnaires, we gather the stories that come to people’s minds when asked a much more open-ended prompting question. SenseMaker questions are deliberately designed to be oblique, without a ‘right answer’, thus hard to gift or game. Social research methods which do use straight questions are not without value, but they are reaching the limits of what they can do, and are often used in places where they no longer fit: where dynamics are complex, fluid and unpredictable. But complexity is not universal, said Tony; it’s one domain amongst a number identified in the Cynefin Framework. Complex. This is a domain in which various ‘actors and factors’ – animate and inanimate – do respond to constraints, and can be attracted to influences, but those constraints and influences are relatively elastic, and there are many interactions and feedback loops which are hard to fathom. Such a system is more like a biological or ecological system than a mechanical one. Cognitive Edge practitioners have a battery of techniques for experimentation in this space, as Tony would soon describe. Tony recalled that his MBA course was predicated on the idea that things are complicated, but there is a system for working things out. The corollary: if things don’t work out, either you didn’t plan well, or you failed in implementation (‘are you lazy, or stupid?’) Later, when he saw the Cynefin model, he was relieved to note that you can be neither lazy nor stupid and things can still go pear-shaped, in a situation of complexity. My personal favourite Snowden anecdote illustrating ‘safe-to-fail’ experiments comes from work Dave did with Meals on Wheels and the Aboriginal communities around Broken Hill, NSW, Australia. How could that community’s diets be improved to avoid Type II diabetes? 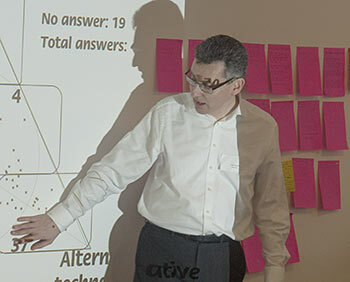 In SenseMaker, micro-narratives are qualitative data; the signifier responses, which resolve into dimensional co-ordinates, are in numerical form which can be be more easily computed, pattern-matched, compared and visualised with the aid of machines. This assists human cognition to home in on where salient issue clusters are. Even an outsider without direct experience of the language or culture can see those patterns emerging on the chart plots. In a project in Bangladesh, the authorities and development agency partners had spent years trying to figure out how to encourage rural families to install latrines in their homes, instead of the prevailing behaviour of ‘open defecation’ in the fields. Tony’s initial consultations were with local experts, who said they would typically focus on one of three kinds of message. First, using family latrines improves public health, avoiding water-borne diseases and parasites. Secondly, it reduces risk (e.g. avoiding sexual molestation of women). Thirdly, it reduces the disgust factor. Which of those messages would be most effective in making a house latrine a desirable thing to have? We had experienced a small exercise with the SenseMaker approach, but the real value of the methods come when deployed on a large scale, either one-off or continuously. Such SenseMaker deployments are supported by a suite of software packages and a database back end, maintained by Cognitive Edge. Normally an organisation wanting to use SenseMaker would go through an accredited CE practitioner consultancy (such as Narrate) who can select the package needed, help set it up, and guide the client all the way through the process to a satisfactory outcome, including helping the client group to design appropriate interventions (which software cannot do). SenseMaker® Collector After initial consultations with the client and the development of a signification framework, an online data entry platform called Collector is created and assigned a specific URL. Where all contributors have Internet access, for example an in-company deployment, they can directly add their stories and signifier data into an interface at that URL. Where collection is paper-based, the results will have to be manually entered later by project admins with Internet access. The SenseMaker Collector app for iOS was first trialled in Rwanda in 2013. Read Tony’s blog post describing how well it worked. The project as a whole was written up in 2014 by the Overseas Development Institute (‘4,000 Voices: Stories of Rwandan Girls’ Adolescence’) and the 169-page publication is available as a 10.7 MB PDF. My favourite case study is one that Tony was involved in, a study in Rwanda of girls’ experience commissioned by the GirlHub project of the Nike Foundation. A cadre of local female students very quickly learned how to use tablet apps to administer the surveys; the micronarratives were captured in audio form, stored on the device, and later uploaded to the Collector site when an Internet connection was available. 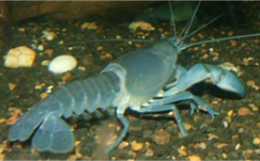 That page also gives links to eleven case studies, and further information about ‘SCAN’ deployments. SCANs are preconfigured, standardised SenseMaker packages around recurrent issues (example: safety), which help an organisation to implement a SenseMaker enquiry faster and cheaper than if using a custom tailored deployment.